Never miss another recipe or giveaway! Sign up HERE to receive delicious recipes in your inbox. After a long day at the office I'm not interested in cooking a labor intensive meal for dinner. I want something that comes together quick and requires little effort. For the most part, chicken breast cutlets tend to fit the bill. Sauteing approximately 3-4 minutes per side in a grill pan, allows me just enough time to pull together the rest of the meal while I wait. Plain grilled chicken can get boring fast, but it's easy to spice it up with a few of your favorite ingredients. 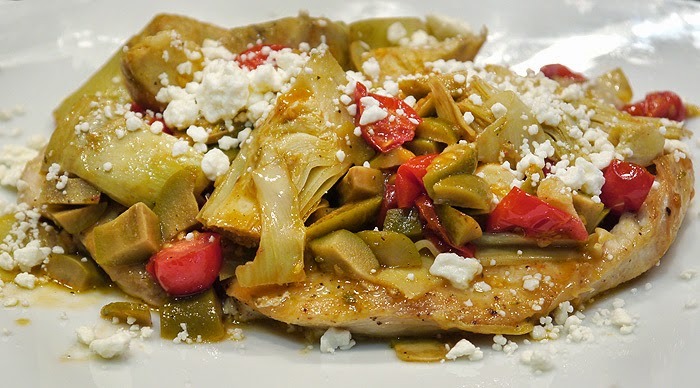 In the recipe below I used a mix of artichoke hearts, chopped olives, feta cheese and sweet bell peppers giving what could've been boring cutlets a Mediterranean flair. Heat olive oil in a large saucepan over medium heat. Add garlic and saute 1 minute or until fragrant. Add bell peppers, artichoke hearts, tomatoes and olives, cook 2 minutes. Remove from pan. Add chicken to pan and grill about 3-4 minutes per side until temperature reaches 165 remove from pan and plate. Put artichoke mixture back into pan to warm up about 1 minute. Divide mixture and place on top of chicken. Finish off with crumbled feta cheese. Chocolate and nuts, any nuts. Thank you for stopping over at The Weekend Social at Kitchen Dreaming and sharing your delicious recipe. Hope to see you next week. My favorite flavor combination is sweet and sour anything but mostly pork! anything sweet with sugar and chocolate! I love the combo of sweet and spicy like jalapenos and pineapple. I am partial to Mediterranean foods and this chicken dish is something I would definitely make at home. Love everything included here, a Delicious topping on fish too! This rally does put me in the mood for the Mediterranean and their healthy food. I agree that plain grilled chicken can get quite boring but your toppings on the chicken sounds delicious! Can't wait to give this recipe a try! This dish looks delicious. Full of nutrients and yummy ingredients. Definately will be trying this dish! this looks wonderful...I love artichokes and chicken! i love anything sweet and salty! Ranch and soy..try it..it is yummy!